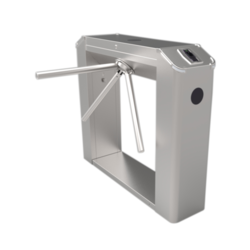 Leading Manufacturer of semi automatic drop arm tripod turnstile, 3/4 th height turnstile, half height turnstile, waist height tripod turnstile, vertical tripod turnstile and single lane full height turnstile from Nashik. Operating Temp. (deg. Celsius) 0 to 55 Deg. Rated Power (W) Less than 40Watts. 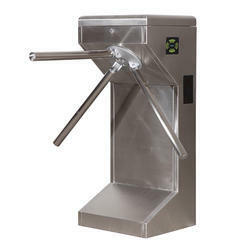 Duty Cycle (%) 100% Continuous,without access control device. Electro-Magnetic Drive Solenoid Electromagnetic with Hydraulic operated systems. Configuration Microproessor based bi-directional operational control units. Current (A) 0.3 A typical. 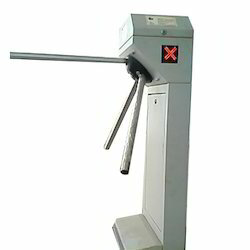 Model: AST-1M1F [AST-IM2-ADA] the Semi automatic tripod turnstile with automatic drop arm features, this model are installed at various offices, like call centers, bpos, IT offices, Banks, & private & public sectors, this model is to be considered to be on of the finest operations for entry & exits access controls with advanced saftey features, like auto emergency drop arms features with solenoid locking mechanism it is rugged & robust constructed. Throughput: 30-35 persons a minute/app. Throughput: 20-25 persons a minute/app. 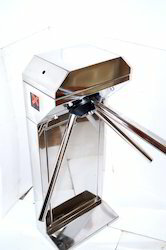 We hold specialization in manufacturing and supplying of Vertical Tripod Turnstile. Sensing is achieved by an array of optical beam sensors. Cabinet is available in Mild Steel powder-coated & Stainless Steel 304/316 grade. 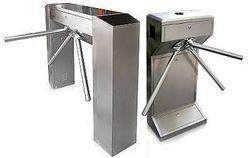 Looking for Turnstile Gates ?